Angela Liguori is a bookmaker and designer originally from Rome now making her home in the Boston area, Massachusetts. Silvana Amato is a graphic artist residing in Rome. In 1988 they founded the imprint Edizioni Almenodue. Studio Carta: "Although Angela and Silvana now live and work on different continents, their partnership flourishes from a shared aesthetic they first recognized as childhood friends growing up in the same apartment building in Rome. " Rome: 2006. Edition of 60. 5.25 x 8.625". Accordion style with 16 panels. Cover paper Kyosei-shi. 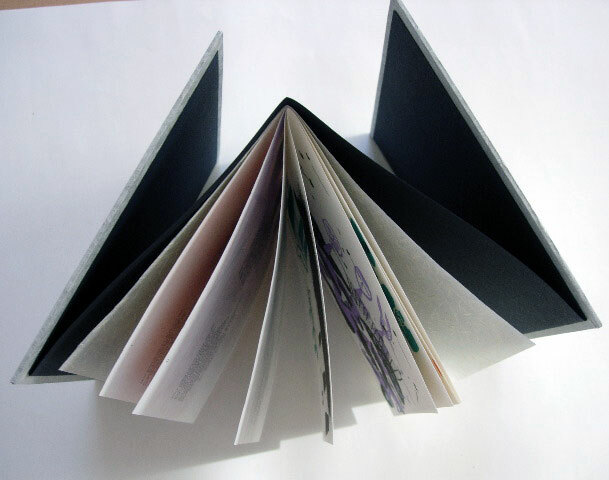 Designed and hand-bound by Silvana Amato and Angela Liguori. Composed in Mirabelle Mignone by Alessandro Colizzi. Italian translation by Giovanni Lussu; English translation by Lemmy Caution. Printed offset on Fedrigoni Savile Row by Stefania Paradiso. Tale about mixing art and weaponry. Tri-lingual (German/Italian/English). 3 x 4.4"; 10 pages; accordion structure. Text in Italian or English. Text in Italian and English. 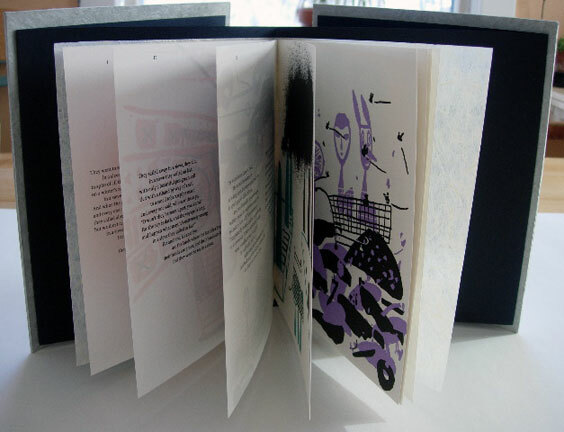 Designed and hand-bound by Silvana Amato and Angela Liguori. Printed in offset on Fedrigoni Italian paper. Boards bound in Japanese Tairei paper with hand-made paper end sheets. Text composed in Sator ( Sumner Stone, 2005). Original poems in Italian by Pecora with English translation by Alessandra Nicifero. Verses by Elio Pecora covering the antics of the insect world. A ladybug suns herself on the limb of an apple tree; the flea moves from a bumpy ride on a cat to a sleepy afternoon on the ear of a dog; a termite boasts of being the destructor. So goes the world of insects. Pecora, a well known Italian poet, received the Laurea Honoris Causa from the University of Palermo, Italy. The poems were specifically written for this edition and for the collaboration with Fabian Negrin, Angela Liguori, and Silvana Amato. The verses are accompanied with color illustrations by Fabian Negrin. A native Argentinean, Negrin began illustrating during his studies in Mexico but now makes his home in Milan, working as an illustrator. He has illustrated children’s books in Italy and elsewhere, and in 2001 began publishing his own children’s books. Italy: 2004. Edition of 150. 8.5 x 7.25", 16 pages. Letterpress printed on Italian Fedrigoni paper. Hand-bound with Japanese Obonai paper on the hard cover and Japanese hand-made paper end sheets. A single signature pamphlet stitch sewing on a folded Fabriano paper. Text in Proforma. Translation from English into Italian by Damiano Abeni. "The Jumblies" by Edward Lear is part of a collection of "Nonsense Songs, Stories, Botany and Alphabet" published in England in 1871. This delightful presentation of his work is a collaboration of graphic designer Silvana Amato, illustrator Fabian Negrin, printer Lucio Passerini, and book artist Angela Liguori. Text is in Italian as well as English. 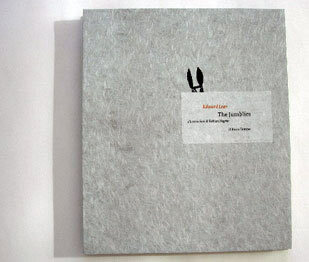 Italy: Edizioni Almenodue, 2007. Edition of 80. 5 x 7"; 60 pages. Offset printed with 5 colors Pantone on Fedrigoni Old Mill paper. Text font Galliard designed by Matthew Carter. Paper: Fedrigoni Old Mill. 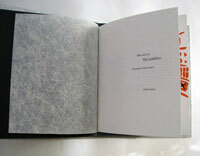 Hand-bound with linen string and handmade paper by Cave Paper. Handmade kozo paper end sheets. Illustrations by Rita Ravaioli. Text in Italian with an English translation by Gillian Riley. Graphic design by Silvana Amato and Angela Liguori. Numbered and signed by the illustrator. Rita Ravaioli (who lives and works in Ravenna): "Giacomo Castelvetro was born in Modena (Italy) in 1546, a nephew of a famous writer, Lodovico, who wrote an essay on Aristotle’s Poetica, his ideas were controversial and pro-Reformation. After his uncle was condemned under the Inquisition, Giacomo and his brother left Modena on a mule, hidden inside two baskets. He traveled in Switzerland, Germany, England, where he stayed for a long time, Denmark and Sweden. "He lived in Venice where he was arrested in 1611 under the Inquisition (his brother had been burned two years earlier) but he was released thanks to the English Ambassador request. He had lo leave Venice and returned to England in 1612, where died in 1616. "During his exile in England, Giacomo Castelvetro wrote in 1614 A brief story of raw and cooked roots, herbs, fruits we eat in Italy for his friends and English protectors to advertise Mediterranean Cooking."